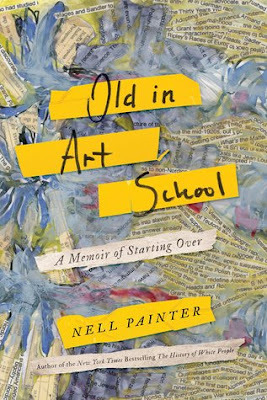 After decades of teaching history at Chapel Hill and Princeton University, Nell Painter left teaching to become a student again. She pursued and completed a BFA and MFA in painting because she loved art and because her mother had proven to her that you are never too old to start over again. As the oldest student in all of her classes and often the only black student, she faced unique challenges. With Old in Art School, Painter attempts to accomplish many things. At its face, this is a memoir about a woman starting an entirely new career at an age when some people think about retirement. It's also a primer on the experience of going to art school, what it means to be an artist today, and an invitation to go down the internet rabbit hole of artists and their work. One of the most interesting facets is Painter's effort to find a middle road between the big picture of her background in history and focusing on the immediacy of a single image. Ultimately, she finds she does not have to choose: a single figure in a piece of art can be indicative of an entire era or the story of an entire people or nation. The most universal part of this book is Painter's realization that once again, she has to find her own way and her own people. The crits (feedback) from her professors and peers are unhelpful, so she finds people outside of the classroom to comment on her work. The art world seems uninterested in anything happening outside of New York City, but Painter finds her first residency after graduation in her beloved hometown of Newark, New Jersey. Perhaps Painter is too old to care about such things, but she is not always a likable narrator. She says exactly what she thinks and feels without worrying about how it makes her look or how you will perceive her. She confesses that she wished her depressed father had died before her inspiring mother and she spares no one's feelings when she calls out the racist or ageist behaviors of fellow students or teachers. Whether or not you agree with her on every page, Old in Art School is an interesting look at an older black woman playing a young white man's game and the difficulties and discoveries of starting a new chapter of life. I love finding books (fiction or nonfiction) that are about older people. Why do we only get stories about beautiful people in their 20s and 30s? This one caught my attention earlier in the year, but I didn't get to read it. I love the idea of someone who is not part of a certain world going into it to explore, critique, and share about it. Super interesting! It is so interesting and I think what is unique here is that she has some knowledge, but it's through the lens of history instead of art.